Over the years, I've amassed a rather large collection of retro computer systems, game consoles, games and more. The Retro Reviews will feature my personal take on some of these games, systems and consoles. After all, what good is a retro computer/game themed website without some stuff about the games we used to play back in the 80s and 90s? Todays game is Golden Axe, one of my favourite games from the late 1980s. Released in 1989, I will take a look at the Sega Mega Drive version as released by Sega. 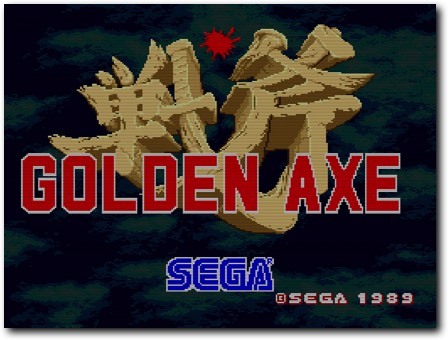 Above: the title screen of Golden Axe. Golden Axe is a classic arcade game in which the player and optionally a friend try to get their revenge against Death Adder, an evil knight who has taken over the once peaceful kingdom with brutal force. This alone would be reason enough to go and take care of him, but in Golden Axe, each of the characters has an additional reason. Someone they know (usually a family member or other loved one) gets killed by Death Adders henchmen right at the start of the game, giving additional motivation for some good old fashioned revenge. This is pretty much all the plot there is, though between levels a small story plays out about the route to take to get to Death Adder. You can play as one of three characters: the Dwarf Gilius Thunderhead, the Barbarian Ax Battler, and the Amazon Tyris Flare. As can be expected for a game of the era, Gilius has the strongest regular attacks but weakest magic, Ax Battler is second strongest in both and Tyris has the weakest regular attacks but by far the strongest magic. Gameplay involves the character(s) moving forward over a scrolling landscape and stopping at regular intervals to do battle with Death Adders henchmen, which get progressively stronger in higher levels. Each level ends with a boss fight consisting of one or two much bigger enemies to take down. Oh well, that's the 80s for you! Anyway, potions and food are really useful, with food restoring a bar of health and potions adding to your magic strength. During the game, you can call on your characters magic ability which damages every on screen enemy, depending on the character you've picked and how much potions you've collected. As can be expected, high level magic can be very devastating. But even low level magic can buy you some time to regroup. There are also rideable dragons in the game, one which flings its tail and two others which breathe fire/fling fireballs. While this may sound awesome, the dragons are mostly useful as a way to gain a damage shield - their attacks, while stronger than yours, are still quite weak all things considered. Be careful though, enemies can (and do) ride the dragons as well and will gladly take your mount if you fall off. The game features 8 levels, ranging from a forest leading to a giant turtle with a village on its back to a giant eagle carrying you to the castle of Death Adder and the dungeons below it. Between each level, there is a short cut scene showing you where you are travelling on the map. These short segments add a lot to the atmosphere of the game and help to sell the illusion of the player being on an epic journey through a strange fantasy world. Golden Axe starts of easy enough, but like most arcade conversions, difficulty soon ramps up. Like most games of this type, it can be challenging to attack the right enemy at the right time and it’s easy to get stuck between two enemies tag teaming you. If you manage to learn how to deal with this and when to use what kind of attack it becomes a very nice game. Two player mode is especially nice, allowing you and a friend to team up together and flank the enemy for a change. As usual, there is some friendly rivalry involved in two player mode. There are not always enough thieves or dragons for both players, which can lead to players rushing in to get the goodies before their friend. At the end of the day, however, two player mode in Golden Axe is mostly a cooperative experience. Helping each other out can mean the difference between success and game over and the extra tactics possible using two players can really make a difference. One weakness in the game is the lack of variety, while there are many different enemies they tend to mostly act in only a few different ways. As a consequence, reaching a new level with harder enemies tends to feel more like having to put in more effort rather than having to develop new tactics. It's possible my level of play is to blame here, I really like the game but am not an expert in any of these horizontal beat-em-ups. The same problem exists for the boss fights. There are only a few different boss characters and the game tends to make the fights harder by merely adding more of the same character to the next fight. I do like the designs of the boss characters, but more variety would have been nice. This version of the game offers the arcade conversion, a special beginner mode featuring only the first three levels and a ‘duel’ mode where you either fight ever harder enemies, or in two player mode fight your friend. There is also an options menu allowing you to set the amount of health you get per life and a sound test menu. Lastly, you can change controls to one of six pre-set control schemes. On the flip side, there are no passwords, or battery backed data. All in all, the extra mode is nice and for an action game like this, the lack of passwords or save features is not really a big deal. Above: these skeletons are messing with the wrong dwarf! The game controls well, responding to button presses with a minimum of lag and feeling precise. The Mega Drive pad has enough buttons for all actions needed and thanks to many different control schemes offered by the game there surely will be one that feels comfortable for everyone. One potential issue is executing combos. Once started, these can be hard to interrupt – making the player vulnerable at such times. As usual for these games, it can sometimes be tricky to align yourself on the right plane for fighting the enemy you’re aiming for. Luckily, most enemies do not change their position on the plane much, so once you’re in the right spot hitting enemies is no problem. This is a good solution to the three-axis of movement problem faced by this style of game, although it isn’t perfect. Nevertheless, it can still be a bit frustrating to miss something that clearly should have been a hit. 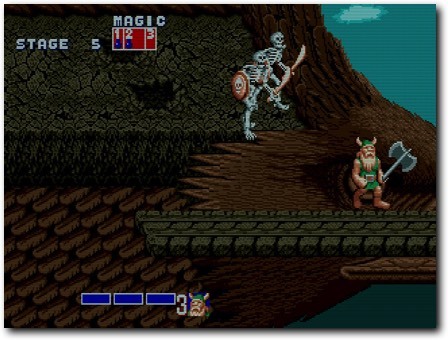 Golden Axe has clear, well defined character sprites and well designed, if somewhat bland backgrounds. For some reason, the background graphics have a completely different choice of palette than the arcade version (and this is true for most other ports as well). I’m not 100% certain the new colours are an improvement over the original choices, but they still mostly work. There is also no background layer scrolling, which is somewhat strange as the Mega Drive can easily display multiple layers on screen and the Arcade does feature such effects (and again, the same is true for most other ports as well). Strangely, the bland backgrounds do offer a gameplay advantage: it’s really clear to see the enemies and where you can and can’t go. Lastly, the magic effects are always nice to see and I’ve always liked that different levels of magic all feature different effects. My favourite styles are the higher end lightning magic and that awesome fire breathing dragon you get with high fire magic. Sound in Golden Axe is a mixed bag. Though I’m not a big fan of the title music, the rest of the music is quite nice. However, the same can’t be said for the sound effects. While the non-sampled effects are usually ok, the sampled effects are not. The samples featured are of very poor quality and annoyingly, whenever one of the samples plays the music cuts out which is very distracting. Overall though, I really like this game. It is different enough from all the street brawlers to stand out and is tuned well enough as to not get too frustrating. Control is always an issue in games of this sort, but Golden Axe deals with the three axis of movement well for the most part. I’d recommend any Sega Mega Drive owner to play this, especially if you can find a friend to help you. *) They may still steal from you at rest points even if you don't beat them up for potions during level one, but I've not actually tried that yet (what can I say, I need me some magic!) so I don't know. Great characters and no slowdowns anywhere in sight. Backgrounds are somewhat bland. Terrible samples, ok sound effects and good music. Golden Axe is one of my personal favourites and the Mega Drive version is quite good, offering some nice extras over most ports.